Dobro vecer prijatelji i obitelj! We have so much to tell you since our last update. 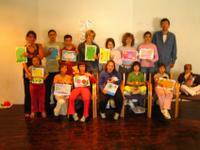 Our first camp, for kids with cancer, ended and the second camp, for kids with downs syndrome has also come and gone. The building has been quiet without the kids here, and we miss them a lot, but we are getting pretty excited for ROM! Our ROM leadership team is growing as team members are arriving here at Hope House. We switched rooms, and are now living on the top floor with two roommates: Lauren from Texas, and Masa (Mah-sha) from a small town in Croatia. Tihomir and Christine have been keeping us busy with projects in preparation for ROM. We even learned a new skill: sewing! This we definitely come in handy, as the two of us are responsible for making 60 robes in the next week! All prayers for this project are appreciated. 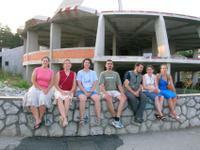 Also, this weekend, we visited the city of Rijeka, on the coast, to attend the Baptist church. Our host “dad,” Tihomir, was the guest preacher. 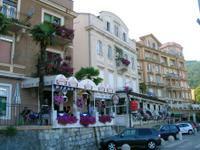 After the service, we spent the afternoon swimming at the beach, and eating sladoled (ice cream) in Opatija. Below are some pictures from the past few weeks. Uzivati! The first picture is of the kids from the downs syndrome camp receiving their diplomas at the end of the week. We got to spend that afternoon prior to the ceremony helping the camp staff (Brett, Mirta & Dinko) create the diplomas. 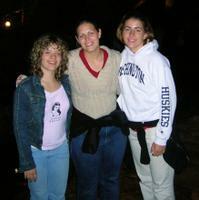 The second picture is of us and our friend Paula, who is the older sister of one of the girls at the camp. The background of the photo is dark because we are in “Spilja Vrelo,” a cave in Fuzine. Even though the outside temperature was nearly 80 degrees F, the inside of the cave stays at around 40 degrees F all year long. The third picture is of us working on our sewing project. Lindsay is ridiculously gifted at cutting fabric & Hillary is learning to sew in a straight line! We just want to make sure you all know that we really are doing work here! The fourth picture is of part of our ROM leadership team in front of the new Baptist church that is being built in Rijeka. The church we attended today will move to this building once it is completed. The church members tell us that the new building will look like a space craft when it is finished. Please pray for the new building to be finished quickly, and for the church’s youth program, which is struggling. The fifth picture is of some beautiful buildings in the lovely town of Opatija, where we spent the afternoon on the beach, after a long, hard week of hunching over our sewing table. The architecture is amazing. Tihomir told us that the town was used as a vacation destination for the Austrian elite around the turn of the 20th century, but now it attracts tourists from all over Europe. We are really enjoying our time in Croatia, and we can’t believe we have already been here for a month. We would appreciate prayers for ROM, specifically that all the participants are able to get their visas without problems, and for their safe travels across borders. Also, that the last of the funding will come through for the conference. Finally, we would like prayers for building strong friendships with the other ROM participants and leaders. When we leave Croatia we want to be able to stay connected with these people and continue to encourage each other in our efforts toward reconciliation and Christ-centered leadership. We love you all, and continue to keep you in our thoughts and prayers. See you soon.